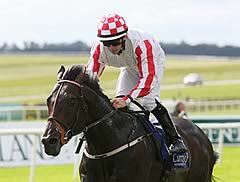 Slade Power held off the challenge of Jack Dexter to win the QIPCO British Champions Sprint. Trainer Eddie Lynam, who won the King's Stand Stakes with Sole Power at Royal Ascot in June, has huge strength in depth in the sprinting division and also saddled the third home, Viztoria. The testing conditions were in Slade Power's favour here as the 7-1 chance was always prominent down the centre of the track under Wayne Lordan. He ended up drifting towards the rail when Jack Dexter challenged, but still seized the day by a neck. Viztoria was another three and a quarter lengths behind the determined winner, but last year's hero Maarek, sent off the 7-2 favourite after winning the Prix de l'Abbaye at Longchamp, badly missed the kick and was always fighting a losing battle. Lordan said: "He's done nothing wrong all year, but he's met a few good horses. Every horse has their day and today is this fellow's day." Owner Sabina Power, who also bred the horse, said: "He stays in training, the breeders are chasing but we get a whole load of enjoyment." Her son, Paddy Power, added: "We were pretty hopeful, but we thought Maarek would be hard to beat. Though we'd won on soft we didn't know how he'd handle it today. Wayne brought him over to the rail and that proved key." Trainer Jim Goldie said of Jack Dexter: "The six furlongs just stretches his stamina, he's getting like his dad (Orientor) and getting quicker as he gets older. He did everything right but had nothing to run with on this side. He's run a great race and we'll come back next year." Maarrek, who was the victor in Prix de l’Abbaye 13 days ago, finished 12th, having been sent of the 7/2 favourite. The soft ground loving gelding played up in the stalls before the race and dwelt, losing a length as they jumped out and thereafter never threatened to trouble the judge in the six-furlong contest.